JACKSONVILLE, Fla. – It’s no secret K-9s and their handlers are crucial members of police departments and sheriff’s offices, but at the same time, you may not know they don’t always have what they need because of tight budgets and lack of funding. That’s where K9s United has stepped up to help fill that gap. If a law enforcement agency is in need of specific item or supplies, the nonprofit raises the money, buys what’s needed, and then donates them directly to the K-9 unit. We’re talking everything from leashes, to bulletproof K-9 vests, to vehicle heat sensors — even a brand new K-9 officer. That’s how the Clay County Sheriff’s Office obtained K-9 Cash. K9s United learned of Clay County’s need for the four-legged deputy and helped pay to make Cash a member of their force. 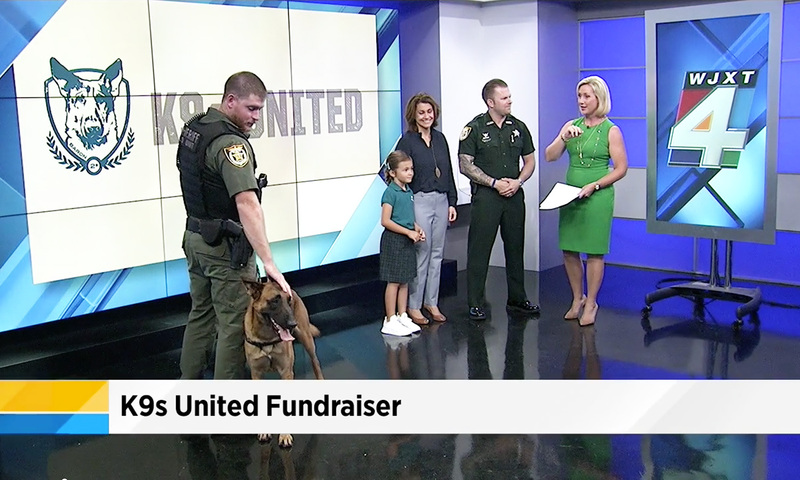 Because of the way the K9s United helped Clay County, and how the nonprofit it continues to help other law enforcement agencies, Cash, Cash’s handler Evan Green and Chris Padgett with the CCSO joined Channel 4’s Morning Show Tuesday as K9s United founder Debbie Johnson and her 7-year-old daughter Emma spoke about their next fundraiser. It’s called “Emma’s Family Fun Day” and will be held Saturday, Oct. 6 at Fantasy Farms in Ponte Vedra Beach. The day will include food, games, prizes, police K-9 demonstrations and more. If you go, you will also be able to see the exotic and domestic animal rescues that are cared for and live at the animal sanctuary — which is not open to the public. K9s United came about after K-9 Baron with the St. Johns County Sheriff’s Office was killed in the line of duty in 2014. Debbie Johnson was so heartbroken by Baron’s death, she looked for a way to help make a positive difference for all police K9s and their handlers in Baron’s memory. Debbie’s daughter, 7-year-old Emma Johnson, has the same passion as her mom, and the mother-daughter duo work side-by-side with their team to make sure every law enforcement K-9 in need is served. You can learn more about the mission of K9s United at K9sUnited.org.